Little Red Bike Cafe: Hello, Is There Anybody in There? Hello, Is There Anybody in There? Well, I suppose this picture is as good as any to begin an update to this blog. When I told Evan I was considering restarting the good ole LRBC blog his response was, "Really?!?" He was genuinely shocked, considering we both kind of felt like it would just continue to exist as a time capsule. Truth be told I've tried writing several other blogs on several other platforms and nothing stuck. And I cannot even begin to tell you how nice it feels to be back in the Blogger dashboard, or perhaps back on this specific dashboard. It may've taken me three attempts to guess the password and username for this blog but hey, I finally got it and here we are. So hello...again. I don't if any of you are still out there. But if you are I'd like to thank you for your patience during our 4 year (how the hell did that happen?!?!) hiatus. So much has happened between then and now, and yet so much has stayed the same. I'll do my best to give the Cliff's Notes version of what's transpired over the last four years. We're still together, Evan and me. (As if there were any doubts!) What you see above is a photo from our vow renewal last year. 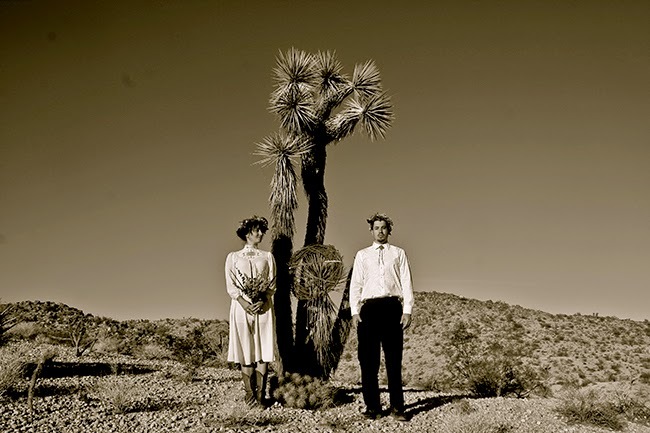 Yep, after five years of marriage we decided it was a good idea to adventure to one of our favorite places on Planet Earth and go ahead to do that whole marriage ceremony over, but this time is was just the two of us...and the joshua trees. Heading to the desert was pretty easy given we now live in Los Angeles, CA. When we closed LRBC we replaced the address on the blog with "Someplace Sunny," and I can't help but find it ironic and yet somehow perfectly fitting that we would wind up someplace that is in fact sunny (like all of the time). We moved here about a year and a half ago. At the time Evan was working for Stumptown Coffee Roasters and they needed some help opening up their new cafe and roastery in DTLA. I was a little hesitant about leaving my post and family at The Woodsman Tavern but I agreed it was time for a change of scenery. In all honestly, after we closed LRBC Portland never felt the same to us. Something changed-namely us. (But that's another story for another day.) So we packed most of our belongings and dogs into a U-Haul with a clean slate in mind and headed south. Speaking of dogs, yeah. They're still here and as weird (and loved) as ever. They've never been happier. They dig the sunshine, camping, and southern California living just as much as we do. So we're Californians now. Officially, too- as in our driver's licenses and plates have also converted. But before you begin to turn your noses up at us let me just say, it's not what you think. I'll admit, Los Angeles was not my favorite place on Earth during the years of 2001-2004. But the city has changed, and I've changed, and now it's the perfect place for us right now. Besides, we live about a mile from my old apartment and Leo is still slinging the best burros and quesos in town after 20+ years. I'd love to tell you more about that and show you just how nice things are here. Which brings me to my next point: we're still food addicts. Hopefully I'll be able to divulge more on that later but in the meantime I just wanted to say, "Hi. We miss you." I will always wait for these things. Glad you guys found a niche in LA! I still miss LRBC, especially as I now live only a few blocks away from where it was. Please keep writing here. I would love to know more about what you guys are up to! Great to see you both are doing so well. North Portland was never the same for me too after LRBC closed. I still check in...but I am a little funny about checking old URLs. We still miss LRBC! Glad to hear you guys are well...and warm. It is a beautifully rainy day, today, here. I still check the LRBC page...but I am a little funny about checking old URLs. I cannot seem to delete them. Glad to hear you guys are doing well...and are warm. It has been gloriously wet, here, lately. I still look at spaces and think, "That'd be a good spot for the LRBC." Take care guys! While blog surfing tonight, I decided to check your blog, just because I am a loyal fan. Wow! Was I shocked to see this latest post! Welcome back! More, please! I randomly decided to check up on you guys and I'm thrilled that you deviates the blog! I just asked my friend, Kati, "what ever happened to the LRBC from your neighborhood!?" And here you are! Yay! Just wanted to say how fondly I look back on my time living 3 blocks from LRBC. At the time I was a 19 year old working in a restaurant and eating at LRBC all the time. Now, in my mid 20's I've taken an interest in cooking -- as I type this I have bagels just about finished baking. I have yet to have a breakfast sandwich in Portland that I like as much as I loved the flat tire. I've certainly never had a better plate of biscuits and gravy than I did eating Sonny's special, either. The bagels in my oven tonight are part of my attempt at recreating the breakfast memories you guys gave to me. Hope to see you both continue to share your love with the world through food. You've inspired me!